This time, we turn to one of the famous Argentine’s stories about religion, language, fatalism, and self-justification. To read along, go here. 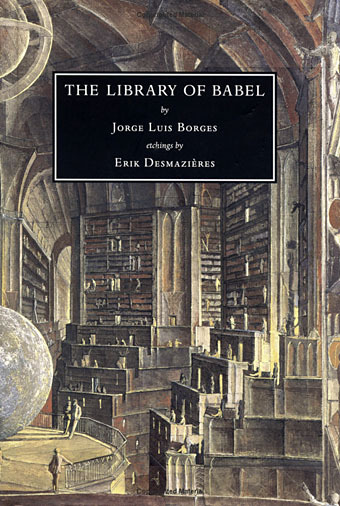 In classic, weird Borges style, “The Library of Babel” takes us to an alternate/future/past universe, one of a tremendous library-world whose citizens are constantly trying to discover the meaning of the world they live in. In sketching this world, Borges touches on deeply religious themes, everything from abstract metaphysics to the everyday roots of anxiety. 1. Each book is made up of 410 pages, each with 40 lines, each lines of 80 characters, using 22 letters of the alphabet, along with the period, space, and comma, for a total of 25 characters. 2. The Library exists eternally, with no beginning and no foreseeable end. 4. The Library has books containing every combination of letters possible, every book (of that length) that could possibly be written. 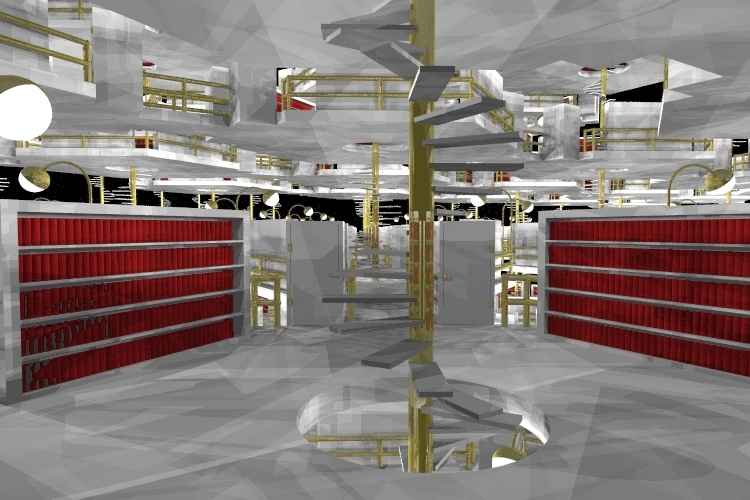 From this last premise, the Library’s inhabitants find out it has everything: an exact four hundred and ten page history of your life, a four hundred and ten page summary of scientific findings that won’t be discovered until the distant future… the possibilities are endless, and their scope is nearly infinite. the first impression was one of extravagant happiness. All men felt themselves to be masters of an intact and secret treasure. There was no personal or world problem whose eloquent solution did not exist in some hexagon. The universe was justified, the universe suddenly usurped the unlimited dimensions of hope. At that time a great deal was said about the Vindications: books of apology and prophecy which vindicated for all the acts of every man in the universe and retained prodigious arcana for his future. Thousands of the greedy abandoned their sweet native hexagons and rushed up the stairways, urged on by the vain intention of finding their Vindication. These pilgrims disputed in the narrow corridors… The Vindications exist… but the searchers did not remember that the possibility of a man’s finding his Vindication, or some treacherous variation thereof, can be computed as zero [limit of 1/n as n approaches infinity]. A Vindication! In Borges’s library, some book exists which can justify your existence, your actions, fit them into some plan for the greater god of the world. Isn’t that exactly where our minds would go, if we were put in this situation? And concomitant with the notion of infinity is the idea of divinity – this desire for meaning already has a religious shading. As was natural, this inordinate hope was followed by an excessive depression. The certitude that some shelf in some hexagon held precious books and that these precious books were inaccessible, seemed almost intolerable. Finitude projecting itself into infinity in a search to justify itself: this is Borges’s dark vision of the world in this story. And it’s also at the roots of the religious project, or search for meaning. In exploring this world, Borges proves both the ultimate powerlessness of ideas (all of which are contained in the library) and the impossibility of ever finding true vindication, even if a book fully vindicating you did exist. In some ways, his message is a commentary on the Tower of Babel story in Genesis, from which he takes his Library’s name. The world is a place of infinite ideas, languages, words, concepts; and the search to build something lasting – anything which justifies us, explains God, or lifts us “up to the heavens” is futile – Borges has plumbed humanity’s limits in this story, sounded the depths. If there is any help to be had, it must come from outside – the Vindication must descend to us, and reconcile us to Himself.